Tuesday night was a bloodbath for Team Adam, which until now had been looking like one of the strongest teams this season. Holly Tucker, left, tears up after learning that she's sticking around on "The Voice" for at least another week. That news meant Judith Hill and Sarah Simmons, both from Team Adam, were heading home after Tuesday night's eliminations. "The Voice" live playoffs have proved again that in an instant the long-presumed frontrunners can get the unceremonious boot. Tuesday night, Judith Hill and Sarah Simmons were the unlucky ones. And with that, Team Adam was slashed from three members to just one — after spending much of the season looking like the show's strongest team. The stunning eliminations came just after their coach had spoken of the importance of taking artistic risks and vowed not to let his team members play it safe with their performances. We'll see next week whether he changes his tune, now that just one-third of his team, Amber Carrington, is left after its risky performances Monday night. Before Adam's other two unconventional divas were sent packing, though, came the customary two hours of arena-worthy performances by the wannabe pop stars and some actual pop stars, plus plenty of pre-elimination suspense. 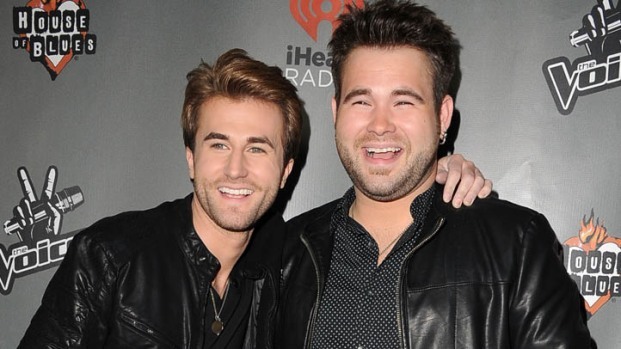 The Swon Brothers Dish On Making Top 8 on "The Voice"
The Swon Brothers' Zach and Colton talk with about making the Top 8 on "The Voice." Also, Colton dishes on his past "American Idol" experience when he audition for Season 7. Sheryl Crow started the night with a performance of her new song "Easy," a loping tune whose Lucinda Williams-esque nostalgic twang suited the three country acts of Team Blake. Perched alongside the long-time "Voice" mentor, the three looked like a slightly nervous songwriters in the round but gamely crooned their few lines apiece. That low-key number was followed by a higher-octane one from Judith and from Team Usher's lone remaining member, dark horse dance-pop nerd Michelle Chamuel. Their electro-heavy cover of Calvin Harris and Florence Welch hit "Sweet Nothing" seemed more up Michelle's alley than Judith's, but their voices paired strikingly as it progressed. And next, the grueling eliminations process began — with Michelle the first to be saved, as she was still catching her breath from her performance. She looked a little baffled to have been the first saved, and at the news, Usher exulted and picked her up off the floor in a huge hug. Next came another performance, this one from the unlikely pairing of Team Blake's country duo the Swon Brothers with Team Shakira's last hope, soul-turned-Broadway diva Sasha Allen. Their collaboration on the Jason Aldean and Kelly Clarkson duet "Don't You Wanna Stay" had an unexpected chemistry, thanks to Sasha's powerful vocals, even as she fought to be heard over the two-man act (and to resist her temptation to gesticulate, Broadway-style). The second singer to be saved in the competition was no surprise. Danielle Bradbery was visibly fighting back a smile, lest she look cocky, from the moment Carson Daly prefaced the pick with "from Team Blake…" The 16-year-old's name was, of course, the one announced, and with the competition shaping up to be a tight one between her and Michelle so far, she may have the right to be cocky. Fresh off her good news, Danielle paired with Sarah from Team Adam on the piano-laden Christina Perri torch song "A Thousand Years." Only a handful of years might separate the two hopefuls in age, but their styles were decades apart — Danielle's that of an ingenue, Sarah's that of a world-weary folk-rock singer. The next contestant saved: Team Shakira's last hope, Sasha — an announcement that seemed to surprise Sasha and outright shock her coach, who had clearly been bracing for the worst. Shakira shrieked and leapt onto the stage, stumbling in her high heels, to embrace Sasha. The night's final performance came courtesy of Amber Carrington and Holly Tucker, who together performed the Reba McEntire and Linda Davis love-triangle duet "Does He Love You." The two blonde pop-by-way-of-country singers nailed the song, but it didn't do them any favors in staking out their own individual identities on the show. Both Amber and Holly were left standing nervously on the stage, too, with the announcement of the next act saved by America's votes: the Swon Brothers, fresh off Monday's faux-campfire performance of the Eagles' "Seven Bridges Road." With the Swon Brothers still in the game, the top six retained its lone remaining male presence. The Swon Brothers' save also meant that all three members of Team Adam, which had long looked like one of the strongest heading into the live playoffs, were in the last four left awaiting the news, along with Team Blake's Holly Tucker. It also meant that at least one member of Team Adam was heading home. Amber was saved next, leaving Team Adam with a horse left in the race. Her duet partner Holly was saved after that, news she greeted with tears of relief. Tuesday's results not only dealt Team Adam a huge blow, axing two of its presumed front-runners, Judith and Sarah, at once. It also meant that Team Blake had emerged unscathed, with all three of its members still in the running — and that meant that a full half of the top six left on "The Voice" are unabashedly country (with another, Amber, leaning country, too). And finally, it meant that there's still room on "The Voice" for an underdog — thanks to the late successes of Michelle from Team Usher and Sasha from Team Shakira. "The Voice" airs Mondays and Tuesdays at 8/7c.